Can I schedule like this? - from Mon to Fri: charge during night for leaving at 8 a.m. 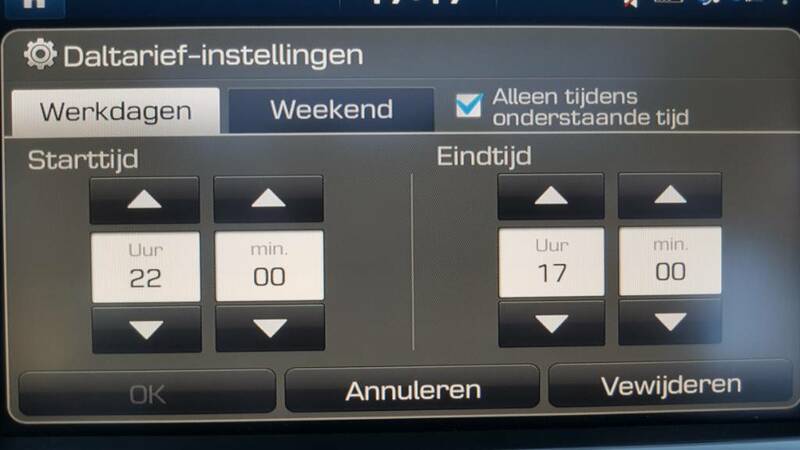 While the 1st setting is easy, I cannot achieve the second setting without pressing the dash button to disable scheduled charging when I park on Sat or Sun. And how does it work offpeak settings? I set my off-peak period from 2200-1700 this only blocks the charging from 1700 to 2200 hours. Since through out the week I only plug-in at home about 1730 this works for me. Charging during the day is not blocked this way and at home it charges after 2200. But in this way your car start charging from 22 ignoring the time when you leave the following morning? It's full at about 0530 when it was empty. Pre-heating is set for 0630 when I leave during the week. So charging stops when full and starts again at about 0600 for heating. Charging takes 7.5 hours on a 3.6kW (3.6/11kW) charger. So I need to start at 2200 to make sure the battery is fully charged when I leave. If you charge at 6.6kW (7.3/22kW charger) and leave at 0800 starting later (like 0200) will be no problem. Last edited by Patrick; 24-02-19 at 04:24 PM. Please can you post a picture of your 'Charging Settings' screen. The screen that shows the Off Peak and Pre Heating Seatings. 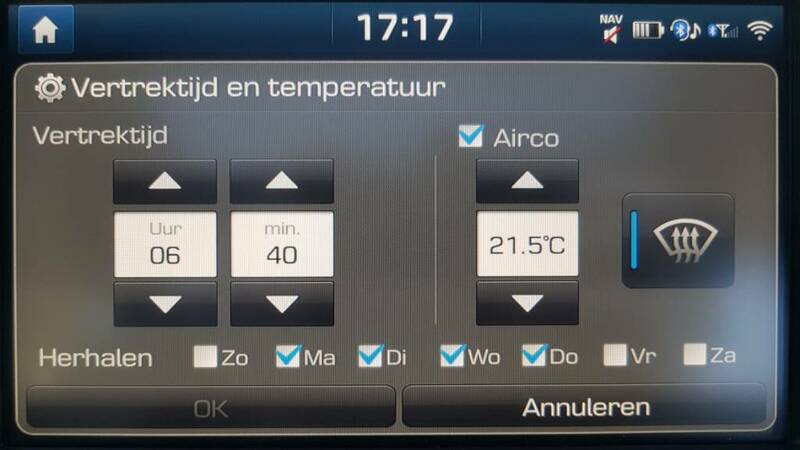 Please can you explain how I need to adjust my settings shown here, so that I can have immediate charging whilst also having the car to Pre Heat before I leave for work. Thank you. 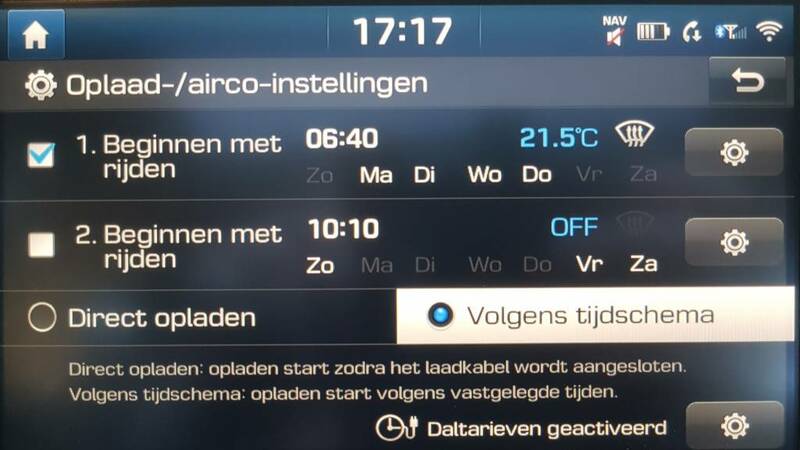 if I put departure time at 8 AM and i connect the plug at 7:30 am (so at 8 clock the car is still not fully charged), does it stops to charge at 8 am in any case or, if I leave the car plugged it will continue charging after 8 ? @chrispazz I don't know if charging stops after pre-heating because I never tested this. I usually leave after heating. Otherways the heat is lost... My feeling tells me it should continue if the schedule allows it. @WatfordIoniq I added the pictures of my settings. You seem to have limited the charging window from midnight to seven in the morning for weekdays. If you would like to be able to charge all the time, just set a time window of 0000-2359 to allow charging. 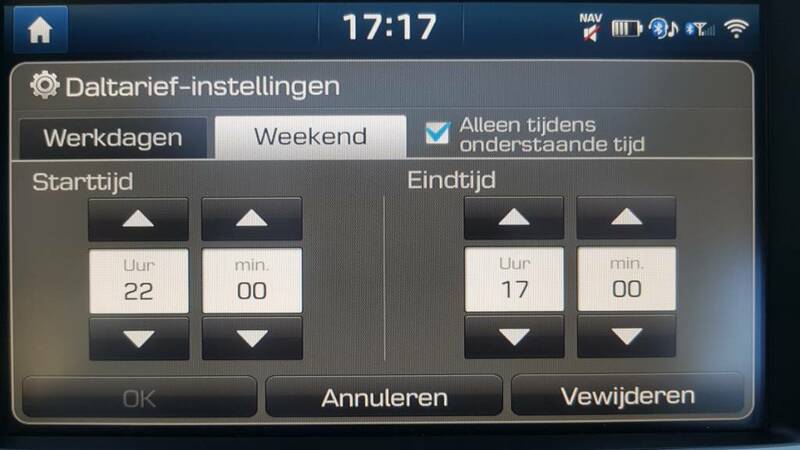 Also look at the departure time day-markings and only set the heating for the days when you need it. Last edited by Patrick; 25-02-19 at 12:03 PM. That's fine because it will help other people. But please do put your model into your signature. Last edited by Patrick; 25-02-19 at 11:50 AM.